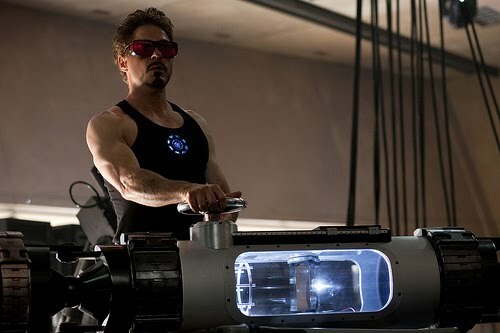 Brad Bose, PhD, the exercise physiologist and kinesiologist who sculpted Robert Downey Jr. for both Iron Man films, designed a series of one-of-a-kind workouts that honor Bose's mantra of "functional performance" – training that accomplishes specific physical goals and keeps the body working at peak performance. Bose says he highly recommends functional training, to reach peak performance or simply "go to the next level." Otherwise, he says, your body quickly adapts to your workout – even after just one or two days. NOTE: Consult a fitness professional before attempting any of these exercises. Fire hose - filled with water or sand and shaken repeatedly... like this. Truck Tires & Sledgehammer - hit a tire with a hammer... like this. Bamboo Bars - "We put rubber bands on bamboo bars then attached kettle bells to the rubber bands on the bar," Bose says. If you typically do a long cardiovascular session, followed by strength training, instead do 10 minutes of cardio between weight sets. When strength training, do different exercises in a different order each time. Vary your cardio routine every time you work out, and from week to week. "One of the weak points people make in their cardio training is limiting it to one piece of equipment, like a treadmill or an elliptical that they might have at their home," Bose says. "The misconception is that because I'm on my treadmill, I'm improving my conditioning… You need to challenge your heart with different levels, and you want to switch to something different." 0 Response to "Iron Man 2 Workout Routine"